Here are a few images of some turning innovations I have come up with that really work for me. First of all, the dust collector. This is built around a recycled HVAC squirrel cage fan taken from a dumpster. These fans are wonderfully quiet compared to all the paddle wheel ones on the market, but they require large ductwork, for their air flow drops dramatically if there is a load. I use the Oneida pleated filter on it, and the pan on the bottom is so easy to clean. The collector system as a whole. All heat or coolness stays in the shop. The blue curtain pulled up for the photo keeps the shavings out of the pleats. The 220V HVAC fan with plywood adaptor panels, close up. The 1/4" plywood cone and 10" ducting. Having a large cone is vital to efficiency of the system. 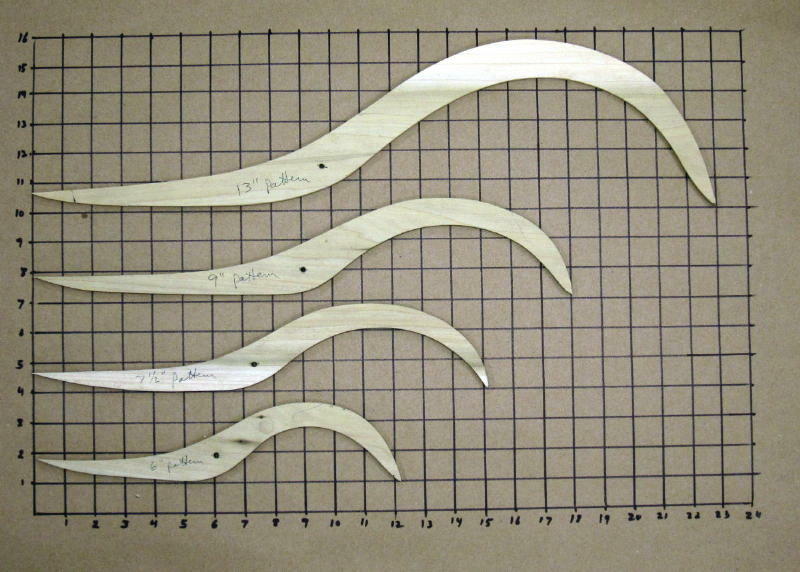 Wooden calipers, 6" throat. Notice reference marks on the right side. Close up of spring. Careful sanding is necessary before assembly to make the gauging tips meet just right. Here is a shot of caliper patterns on a 1" grid. The curves need not be exact to make this most functional tool. 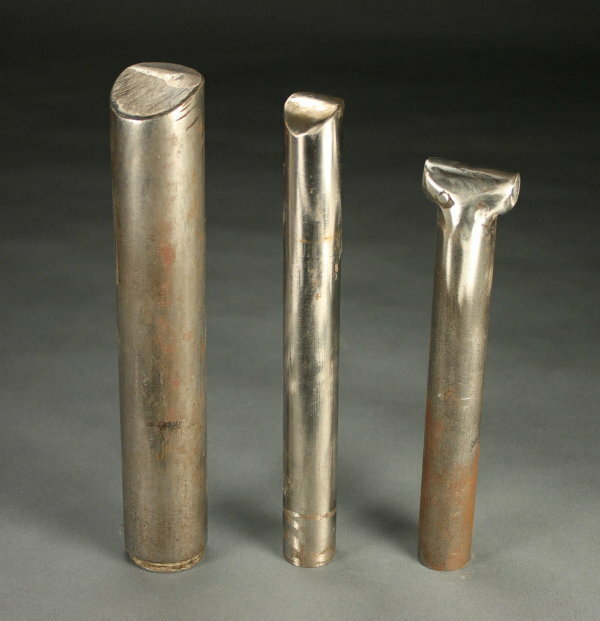 The gouge extension before assembly. 3/4" cold rolled steel bar stock has 1/2" hole drilled 2 " into one end. 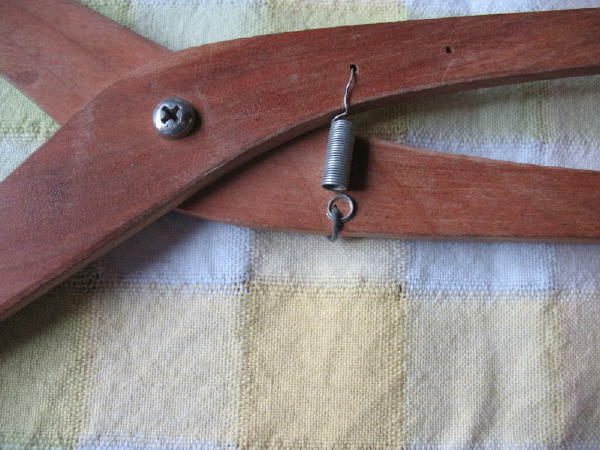 Medium CA glue firmly bonds extension to wood handle. Thin CA is run downthe gouge into the extension. A propane torch will break that bond loose to replace the gouge. This is 7/8" stock for a 5/8" gouge. The home turned handle is too thick for comfort. Sometime back in the early 1980's I was introduced to the Thompson boring bar at a workshop with David Ellsworth. I went home and made one for myself with 36" of 1" cold rolled steel and a hacksaw (bottom tool below). I turned a lot of deep globes with it, and had a 3/4" dia. made to compliment it. Twenty years later I bought a flat bar version made by Bob Vaughan (top tool below), and found it most steady. So I adapted the slotted bold idea to some 3/4" x 1 1/4" flat stock, and came up with the tool in the middle below. Denny Martin, a turner and machinist in our local club, made me two more sizes of this tool. They really work well, especially using a prop stick below the right hand to hold the tool level with only downward pressure. or a finer final skimming cut with the center or left side. Bottom of tool, showing tapered head of split bolt carefully ground and seated to be flush for smooth removal from spinning bowl. Using the boring bar with a prop stick. My hand wraps around the tool handle and grips the prop stick. 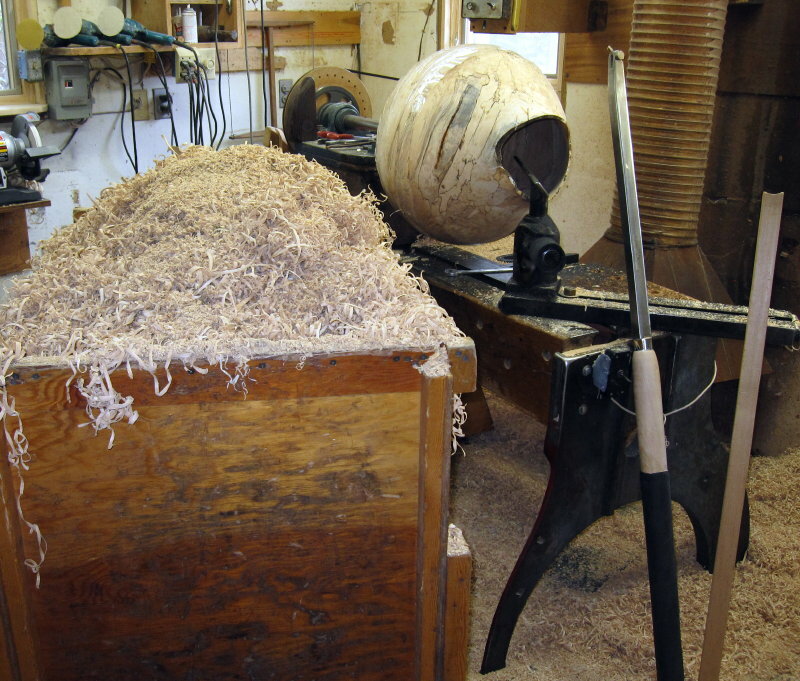 The boring bar, prop stick, and cart of shavings that came out of the bowl bit by bit. The toolrest is out of position for the photo. with a bevel on one side. Mine is 1 1/2" diameter, but the 1" works great too. provide a relief undercut up to the screws. before the parting tool was used. With the post up close and slightly to the right of the slot you get good support for the parting tool. Here is the post in 1" stock for my 1642 lathe. And are the three posts, with one on the right widened to 1 1/2" by welding a rod across the top. I make my own faceplates, finding them much sturdier than any cast iron or milled aluminum ones on the market. I've made them for years, starting with a set with 1" x 8tpi thread nuts, then making a new set with 1 1/4" x 8 tpi nuts to match my "new" Powermatic, and then I made a new adaptor from 1 1/2" to 1 1/4" thread for my big lathe. I now use the 1 1/4" faceplate almost entirely, as it will handle an 18-20" bowl with comfort and more stability than the 1" thread. My friend Elbert Dale made a set of 7 for me, much better than I could with his superior welding skills. I have two 5" faceplates with 1 1/2" x 8tpi nuts for the huge bowls. But they are awkward to work with. The basic faceplate is 1/2" thick plate steel cut 4" diameter. I also have a set of 3" diameter ones out of 3/8" steel that Denny Martin had cut by someone using a laser machine. These are noticeably smaller and lighter and are only good for small bowls. My original faceplates had 1/4" diameter holes drilled in them. This gives some play with #12 screws, allowing me to angle them inward as I drive them into the blank, creating a toenail effect that I am convinced holds the bowls better, plus moving the tips farther towards the center of the bowl, more out of the way when you undercut the bowls and find out if you left enough room while hollowing. Over time the machine screws wallowed out the holes, permitting even steeper toenails. Elbert Dale took this fact and drilled the holes in his faceplates at a 10 deg. angle. This aims you the right way, but is not absolutely necessary. When you go to #14 screws with the biggest bowls the added angle is helpful. No matter whether the plate was cut with a laser or a cutting torch, it will need truing up after the faceplate is finished to give a smooth and easy to use tool. Here is a set of nuts ready to be welded to the plates. Note the layout lines on the left one, the one pnunched hole center still visible on the inner circle, and all the rest pre-drilled with a sharp 3/16th" bit. On the center plate five of the holes are drilled through with the 1/4" bit. The center hole is nice to peek through when you are placing the faceplate onto a blank that has crossed lines for location. Here the nut is clamped to the faceplate, with the tips of the nut centered between the inner circle of holes. As you can see I have only welded the parts that do not interfere with the holes. I center the nut visually over the center hole, then measure each of the size points to the outer perimeter for final accuracy. Here is a finished faceplate made by Elbert Dale. He ground a deep undercut on the nut so he could weld continuously around out of the way of the inner circle of holes. You can see that the angled machine screws dig into the outer side of each hole but leave the inside towards the nut unscarred. I typically use 1 1/4" #12 screws for the outer circle, and 1" long for the inner, which are all that is left holding the bowl for sanding. 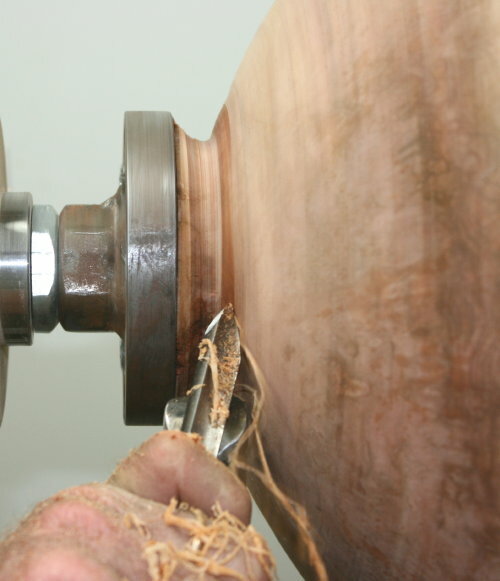 I remove the outer ring to undercut the bowl as much as possible and to greatly reduce the chance of checking. 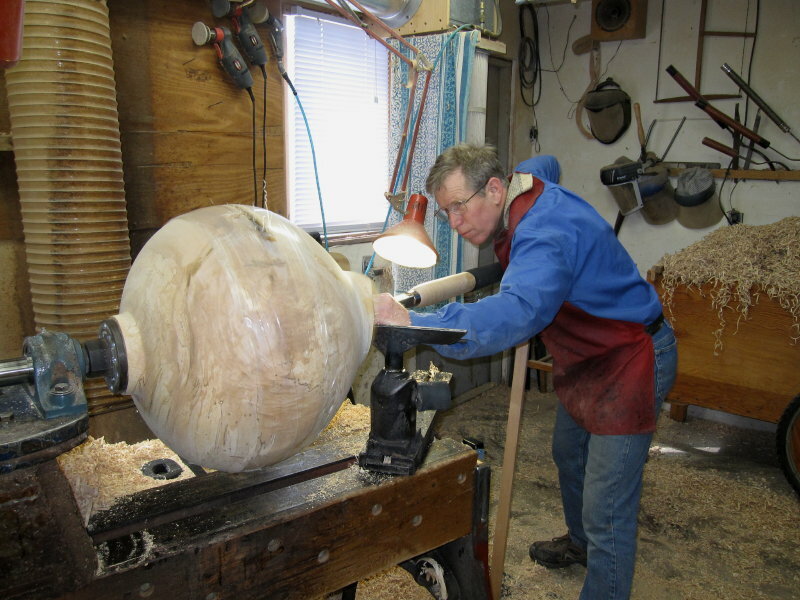 It is the face of the nut about to seat on the shoulder of the lathe spindle. That what makes it firm. The threads are loose and easy to turn. A bowl simply spun on by hand, or even an empty faceplate, will lock firmly enough against the spindle to require a wrench to break it away. I only run the lathe in reverse for sanding, never for cutting, and I've never had a faceplate work loose that was seated. Here is the faceplate on the Powermatic. Notice the washer super-glued to the spindle shoulder. Because a Powermatic has that slot cut for a locking screw, it is too deep for the face of a 1 1/4" nut to reach the shoulder and provide a firm lock. The washer is only 1/8" thick, but that is enough. Having a set of faceplates allows me to turn 10-15 bowls before I stop to sand them. I leave the faceplate on the turned bowl until it is sanded. I do have to part it down to just over 1" diameter right away before setting it aside, so it won't crack while the first stage drying is going on. Although it takes a little time, if you have a welder and access to some plate steel, you will be well satisfied with homemade faceplates.